The Centerforce LMC Series is a specifically designed low inertia performance clutch that dramatically reduces engine rotating mass. These light weight, SFI approved competition clutches are intended with most road racing and circle track applications in mind. Centerforce machines these special pressure plates from high-strength aircraft-grade billet aluminum and then attach a special heat-treated replaceable friction surface. The Centerforce LMC series friction disc utilizes a dual-segmented carbon composite lining for improved cooling and excellent torque capacity. 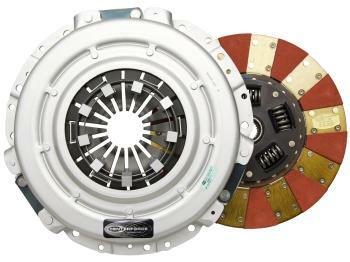 This new series of Light Metal Clutch assemblies from Centerforce uses their patented ‘Ball Bearing’ actuated diaphragm and centrifugal weight system for maximum grip while maintaining a comfortable and controllable clutch pedal. When used in conjunction with Centerforce’s aluminum flywheels, LMC Series brings the term ‘Light Weight’ to an unparalleled level!